We have a surprise for you! We're excited to share with you a Phone-A-Friend UPDATE! You might remember Laura, Blythe's sister-in-law? Well, she has been busy working on her living room makeover and we can't wait to show you the results. But first, see the original Phone-A-Friend here. Since July, Laura has done of lot of work, and has now asked for a few more suggestions. Naturally, we are happy to oblige! What could be more exiting than 4 new chairs, you ask? Well, only a baby! That's right, Laura and Scott are expecting a baby boy in May! Which means Blythe is going to be an Auntie! Whoohooo! Ruled out an area rug and under tv console table for cost/size reasons. For lighting we're recommending a pendant lamp (Blythe has this one in her kitchen!) since the room is already wired for a ceiling fixture. 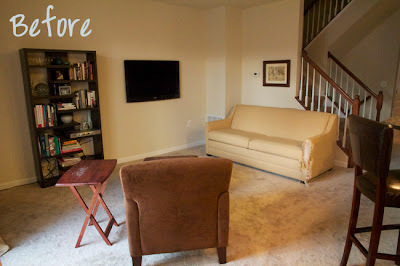 We would also love to see a floor lamp, perhaps in the back corner to provide additional light and round out that space. We love these curtains from West Elm. The pattern is terrific and important since the rest of the room right now is solids. We suggest hanging them higher, from the top of the transoms instead of where the doors begin. For storage to the left of the TV, we love this Parsons bookshelf. You can stack it with baskets and books for bambino! Colorful accessories displayed on top are a must (frames, blue box, elephant white box). And check out our art suggestions. The pear is an Etsy find. 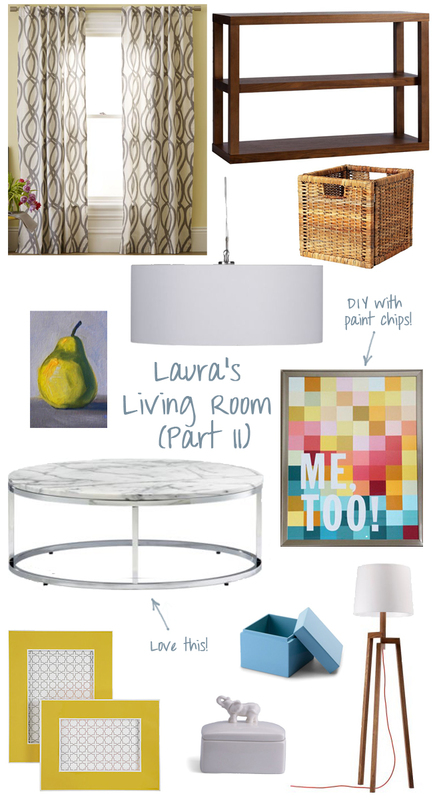 And the paint chip art is a DIY from one of our favorite bloggers, A Beautiful Mess! Finally, we adore this round coffee table from cb2. It's perfect to center the chairs around and will look great with the pendant lamp. Its also low enough that you can easily walk around it! And a final note not included in our mood board: don't forget pattern! 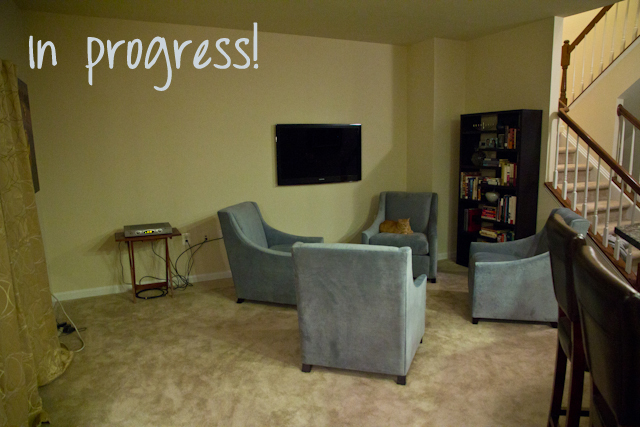 Those chairs are looking mighty lonely without some fun and graphic throw pillows. Don't worry about matching the curtains or chairs, they should be colorful and festive. Do it up! Thanks for keeping us posted! Keep it up, Mama!